Control capability built-in to VFDs are moving machine intelligence to the edge. Jeff Payne, Product Manager for AutomationDirect, wrote an article for the March 2019 issue of Design World, titled VFDs with integrated PLCs for motion and machine controls: Programming and setup considerations. Payne explains how AC drives can be controlled by either an external or an internal PLC and how to integrate these drives. Though AC drives can operate in standalone, they often integrate into automation systems to control speed of three-phase AC motors that commonly run conveyors, fans, and pumps. For such speed control, AC drives most often pair with PLCs. But AC drives are becoming more intelligent … and some now include built-in PLCs to work as smart drives. An AC drive is often referred to as a variable frequency drive (VFD), an adjustable frequency drive (AFD) or a frequency inverter, Payne explains. We use the term VFD for its main function of varying the speed of a three-phase AC induction motor. VFDs also provide motor overload protection, non-emergency starting and stopping, and control of acceleration and deceleration. VFDs operate by rectifying incoming AC power to DC, which is then inverted back into three-phase AC output power. The voltage and frequency of this inverted output power is controlled by the drive to vary the speed of a three phase AC induction motor. A VFD is controlled by discrete inputs (two- or three-wire control), analog inputs and/or digital communications. A two-wire control setup provides a run command input and a direction input to the drive. With three-wire control of a drive, a stop command is added to the drive control inputs. Both two or three-wire drive control methods can be via manual pushbuttons, PLC-activated relay outputs, or PLC discrete signal outputs. Some drives also have programmable functions such as jog, speed change, and acceleration and deceleration control. Many VFDs, such as this AutomationDirect DURApulse GS4 series AC drive, can be controlled and monitored by an external PLC. In addition to discrete and analog inputs, PLCs often control VFDs using digital communications such as Modbus ASCII and Modbus RTU, or via industrial Ethernet protocols specifically created for real-time control. Payne says this two-way digital communication often enables all drive commands to be controlled by a PLC, as well as monitoring all drive parameters and reading drive variables, status and fault codes. This can include well over 100 commands, parameters, status and fault codes. Upfront programming of the drive’s monitoring and control functions (through discrete communication) makes for a more intelligent system. A serial or Ethernet link between the PLC and drive(s) is required; with Ethernet, a hub or a switch is also needed. The ability to configure, control, and monitor the drive from the PLC via digital communications helps futureproof automated systems. PLC control of VFDs is well-developed with many control, configuration and monitoring options. However, devices at the edge are becoming smarter, and that is true of VFDs with built-in PLCs. These VFDs provide all the precise variable speed control functions offered with separate PLC-controlled drives, but in one compact package, with no integration required between the PLC and the drive. Such Smart drives typically have a built-in operator interface panel and a SoftPLC. Via the interface panel, it is possible to control the VFD and view (and adjust) its parameters. These WEG-CFW300 AC drives from AutomationDirect offer high performance in a compact size, along with a built-in operator interface and a SoftPLC. They eliminate the need to purchase, install, and integrate an external PLC with the drive. Some vendors provide free PC-based programming software for the SoftPLC portion of the drive to create custom-tailored control schemes, which are downloaded from the PC to a port on the drive, often via a USB connection. Common applications for smart drives include packaging machines, mixers, kneaders and conveyor belts. Payne says other typical applications include control of fans, exhausts, centrifugal pumps, granulators, palletizers, stirrers, and conveyor belts. Many conveyor or gate applications need to monitor inputs from a few sensors to properly control a VFD as well as an output to trigger a solenoid. A VFD with a built-in Soft PLC can monitor sensors and run programmed logic to properly convey products. A smart drive with a built-in PLC, carefully selected to meet full load amperage, overload and temperature requirements, can monitor the sensors, make programmed decisions, and control the drive and the field devices. In an array of applications, smart drives can often control entire machines or systems … helping negate the need to purchase, install, and integrate separate PLCs and operator interfaces. 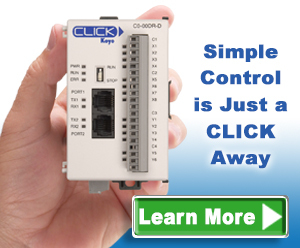 To read more articles about programmable control, click here.